Originally from Peachtree City, Georgia, Nicholas is currently pursuing a Professional Artist Certificate from the University of North Carolina School of the Arts under the tutelage of Dr. Mark Norman. While his main instrument is tuba, Nicholas has also taught and performed on euphonium, tenor trombone, and bass trombone. His teaching career began at the age of 16 when he was asked to help one of the middle school students next to his high school with their All-State preparation. Within a year, he was managing 10 students ranging from 5th grade to 10th grade. From there he attended Columbus State University where he studied for four years with Andrew Miller. In the Spring of 2011, Nicholas was a finalist in the Southeast Regional Tuba and Euphonium Conference’s Mock Band Audition competition. During that same semester, he joined the national music fraternity Phi Mu Alpha Sinfonia where his passion for teaching grew. Nicholas received a large amount of playing experience at Columbus State through his participation in the Wind Ensemble, Wind Orchestra, Philharmonic Orchestra, Pheonix Brass Quintet, CSU Trombone choir, and CSU Tuba Quartet. Nicholas graduated Columbus State in 2013 with a Bachelor’s Degree in Music Performance. Wanting to continue his growth in music, Nicholas went on to pursue a Master’s Degree in Music from the University of Wisconsin – Milwaukee where he studied with Matthew Gaunt. During his two years in Milwaukee, Nicholas reached out to several local high schools to lend both his playing and teaching abilities. In the spring semester of his last year, Nicholas won the band division concerto competition playing Richard Strauss’s Horn Concerto No. 1, Opus 11 and was granted the opportunity to participate in a masterclass led by James Gourlay at the Southeast Regional Tuba and Euphonium conference. He graduated from UW-Milwaukee in 2015 with a scholarship to attend the Philadelphia International Music Festival where he would both play in the collegiate house program and coach the younger brass chamber ensembles. During his residency here, he studied privately with Carol Jantsch and Matthew Brown. In moving to Winston-Salem, Nicholas has subbed with the Greensboro Symphony Brass Quintet and has joined the Winston-Salem Reading Orchestra. 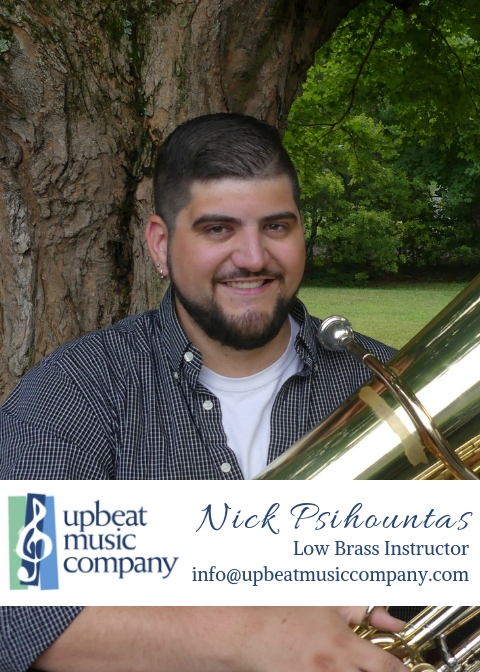 Nicholas is currently the Principal tubist for UNCSA’s Symphony Orchestra and Wind Ensemble, and is a member of the school’s Chrysalis Brass Quintet chamber ensemble. Nicholas plans to graduate with his certificate in the spring.